Chopstix Group UK, the Oriental quick service restaurant brand and its partner Petrogas Group Ltd, Applegreen plc are pleased to announce the launch of a new restaurant in Jobstown today Wednesday 12th August 2015. Situated in the suburb of Tallaght, Jobstown is the fifth Chopstix Noodle bar launched by Petrogas and Applegreen plc. Chopstix Group UK reached a milestone with the launch of Jobstown taking the number of Chopstix Noodle Bars to 51 sites across the UK and the Republic of Ireland. 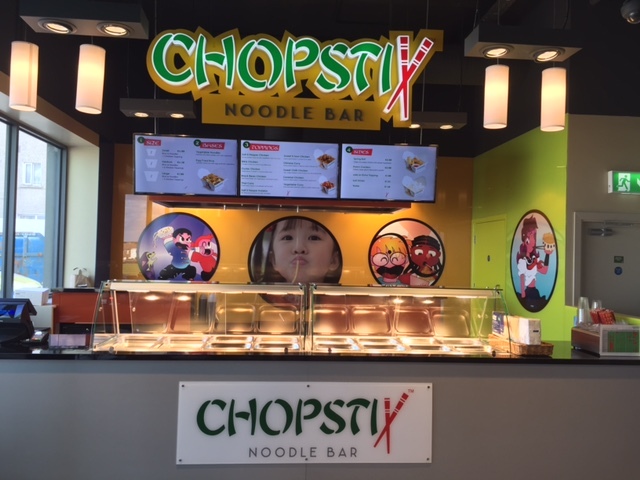 The Chopstix Noodle Bar offers operators and customers a unique opportunity to satisfy the lunchtime, afternoon and evening demand for faster, healthier and fresher Oriental fusion food at great value prices. Research shows that customer satisfaction is at 96% and when asked if customers would recommend Chopstix Noodle Bar a staggering 94% of customers said yes! (Oxxygen Marketing Customer Satisfaction Survey Dec’14). Petrogas Group Ltd, Applegreen plc is the first international franchisee of the Oriental quick service restaurant brand. After this first franchise success, Chopstix Group UK is ready to support Master Franchisees worldwide as well as in the beautiful Northern and Southern Ireland. Chopstix Group UK has developed an ambitious and comprehensive franchise support program that can deliver a net profit margin of over 60%. Chopstix Group UK is looking forward to welcoming any other franchisees to be part of its success and growth!